Google Chrome can't be installed in Ubuntu 13.04 Raring Ringtail (fresh install) for now because of a missing dependency: libudev0. 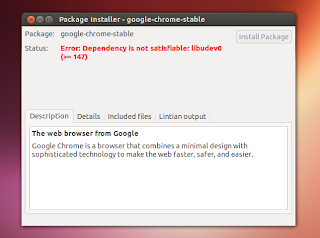 Until Google fixes this, here's how to install the missing dependency so you can use Google Chrome (any version) in Ubuntu Raring. You can install Chromium via Ubuntu Software Center instead of Google Chrome, but you won't get the extra features that Google has added to its browser, like the built-in PDF viewer, the latest Pepper Flash and so on. I've upgraded from Ubuntu 12.10 to 13.04 and libudev0 was kept during the upgrade so I didn't have any issues installing Google Chrome. But on a fresh Ubuntu 13.04 Raring Ringtail installation, Google Chrome can't be installed because libudev0 is not available in the Ubuntu 13.04 repositories. Update: this issue has been fixed in the latest Google Chrome Dev channel release (thanks Biswarup Ray for the info!) and the fix will probably land soon in the stable and beta versions.